Unless you are a Roman-Catholic, you have probably never heard of Saint Ignatius of Loyola and that is a shame. Ignatius was born to a noble family in the Basque region of Spain. He grew up rather unremarkably until he was hit by a cannonball in during the Battle of Pamplona in 1521. The injury almost killed him and his recovery changed his life forever. Lying on his sickbed, Ignatius could do little more than read. He had asked to be given books detailing stories of knights on campaign and chivalry. Instead he was given St. Thomas a Kempis’ Imitation of Christ. That book thoroughly changed his life. He became a Christian, dedicated his life to the service of the Lord, and birthed a religious society that became one of the most influential orders in the last five hundred years. Beginning with five friends, Ignatius founded the Society of Jesus. Today members place the letters “S.J.” after their names because, in spite of their more notable nickname, they are still members of the Society of Jesus. 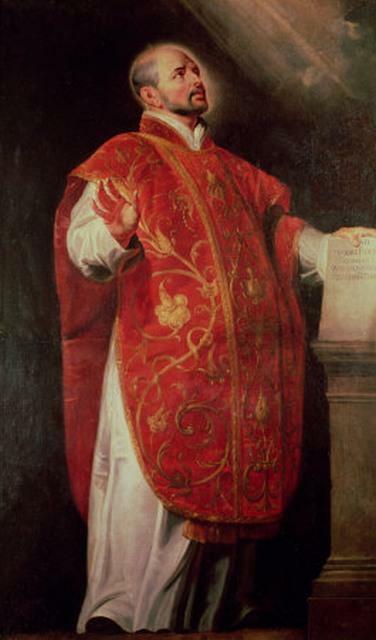 Those who scoffed at Ignatius referred to his organization as “The Jesuits,” and the name became part of the society’s heritage. The Jesuits were heavily involved in the response to the Protestant Reformation and were leaders in what has been called the Counter-Reformation. Along with a heavy influence on missions, the Jesuits became highly involved in established educational institutions as a means of spreading the Catholic faith. Part of their approach to missions was to educate the locals in reading and writing in order to raise up indigenous clergy who might have more credibility with the unconverted locals. The method proved extremely effective and the Jesuits were key players in the evangelism of South America, India, and the Far East. 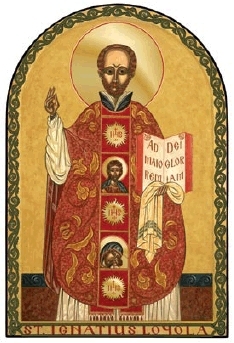 An Icon depicting St. Ignatis with one of his more famous phases Ad Majorem Dei Gloriam (to the greater glory of God). In America, the Jesuits are most known for their institutes of higher education. St. Ignatius hailed from a region of Basque Spain known as Loyola and, as such, he is now known as St. Ignatius of Loyola. There are four Loyola Universities in the United States. They are located in Los Angeles, Baltimore, Chicago, and New Orleans. I took my own undergraduate degree from Loyola University of New Orleans and, as such, I am a product of the notorious Jesuit educational system. St. Ignatius and the Jesuits have been much maligned over the years. Those who have professed the “Whore of Babylon” ideology of rabid anti-Catholicism have accuse the Jesuits of everything from idolatry to the John F. Kennedy assassination and the Holocaust, to even include the creation of Islam. Yes, there are those who actually profess that the Jesuits (formed in the sixteenth century) secretly created Islam (founded in the seventh century). In spite of all of the slander, St. Ignatius was a man fully dedicated to the service of the Lord. He dedicated his entire adult life to the spread of the Gospel. Even more so, he was a man dedicated to prayer. To conclude this little homage to one of my patron saints, I will include two of the saint’s most famous prayers. The first prayer, the Anima Christi, is often used as a post-communion prayer and the second is often used as a dedicatory prayer at the very beginning of the day. Soul of Christ, sanctify me. Body of Christ, save me. Blood of Christ, inebriate me. Water from the side of Christ, wash me. Passion of Christ, strengthen me. O Good Jesus, hear me. Within your wounds hide me. Suffer me never to be separated from you. From the malicious enemy, defend me. save that of knowing that we do thy will. Amen. O God, by whose grace your servant Ignatius, enkindled with the fire of your love, became a burning and a shining light in your Church: Grant that we also may be aflame with the spirit of love and discipline, and may ever walk before you as children of light; through Jesus Christ our Lord, who lives and reigns with you, in the unity of the Holy Spirit, one God, now and forever. Amen. I fortunately work at a school that mentions many of the saints in it’s History books. Although the word “Saint” is left out, I am encouraged that the students get to learn about important Christian fathers. That’s great, Robert. My school uses (I think) Bob Jones University’s curriculum for history. To say the least it’s not fond of the old RC’s. That’s ok, though. I make a point of noting the really big ones and, since every I post an article here it goes up on FB and many of my students are my friends on FB, I’m sure that one or two read them every once in a while. Ok, well, I have one student that might read them every now and then… I love it when my students go to a source in stead of reading what someone said about them. Primaries are the best. You’d be surprised, but I have actually heard that (and worse) before… Of course, I’ve been in the sub-basement of one of their “command centers” and I know what really goes on there.